Hello, I’m new to the forum. I have a 1960 seahorse 75 v4 Sl 12 with some different timing marks than those pictured in the factory service manual. There is a long “line” type mark on the magneto belt pully, but no such line on the magneto housing. There is a small dot on top of the housing. I don’t see a mark on the magneto bracket and according to the manual there are three marks to align on the side of the magneto. To further confuse the mater, apperantly there is another mark on the front of the magneto housing that possibly lines up with the edge of the magneto bracket? Your post didn't go unnoticed. Will check my books and see if I can clear it up somewhat. Sending a picture as a pdf, don't know if they will open here. 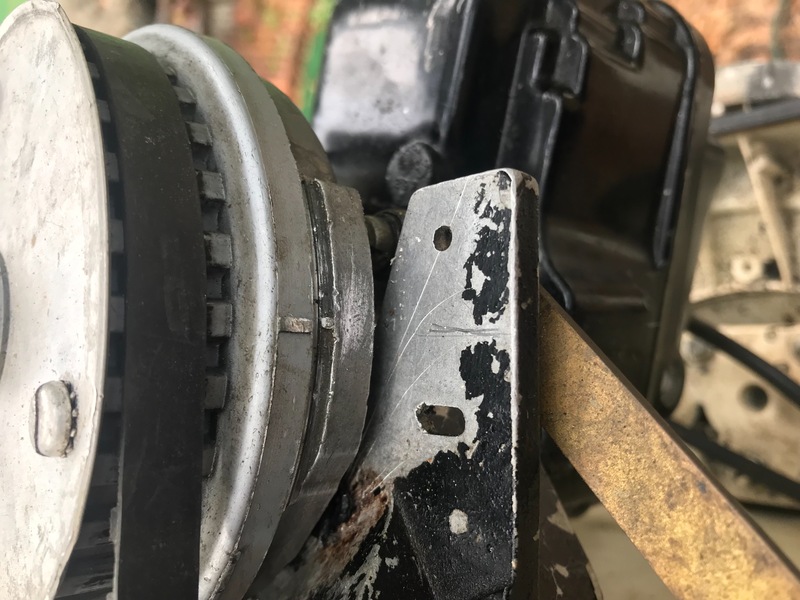 The timing mark on the magneto mounting bracket under the flywheel can be a hard find, usually painted over or covered with gookie dirt. The page is for figure 16 only. don't pay attention to the writing. It helps to remove the spark plugs, makes it easier to turn the motor by hand. 1. Rotate the flywheel clockwise until the timing marks on the rewind starter housing, flywheel and crankcase align. You'll need a flashlight to see that hidden timing mark on the crankcase. 2.The magneto pulley timing marks should align with the safety switch plunger. If they don't align loosen the magneto bracket and release the belt tension then rotate the pulley until the marks align then tighten the bracket. Loosen the belt enough in case you have to move a notch forward or back. Tighten the belt tension so it just deflects about 1/2". Thanks for the help! I scraped paint off the magneto bracket and found a line. So on the magneto pulley there is a 3/8 long raised line, on the magneto housing there is just a dot, and on the magneto bracket a long thin line. It’s odd that the service manual pics aren’t a good view of the actual marks. I’ll try to send a pic.